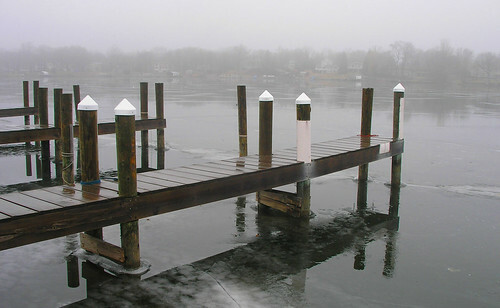 The warm weather,foggy dew and scarce ice fishermen on the lake create a Samuel Beckett “Waiting for Godot” backdrop - without a bench. Pools of water speckle the diffused grey lakescape and an occasional premordial ice house sets in solitary protest. 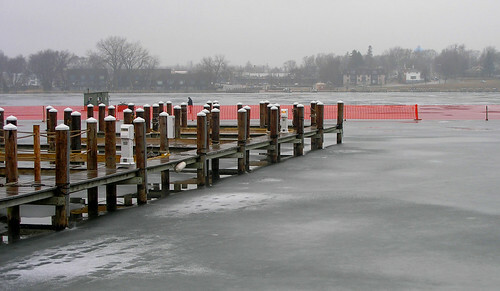 The conceptual artist Christo created “The Walking Fence”. It was an airy wandering fence heavy on public and private financing, light on functionality. 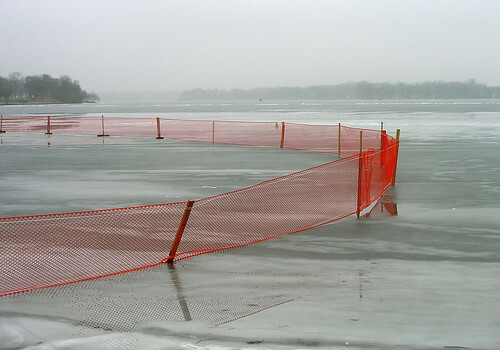 On Lake Minnetonka bright orange border fencing runs along stretches of blackened ice and broken areas of shoreline. The fence is moderately functional. It protects marina owners from lawsuits. Occassionally it deters a wanderer. Highway 101 runs South to Shakopee where it joins Highway 169 and follows the Minnesota River through southern Minnesota. Historically this North/South route was traveled by Native Americans during hunting migrations and during battles. Chowen’s Corner-Deephaven, rests at the edge of this Indian trail. Early Chowen's Corner settlers tell of watching long lines of warriors pass, sometimes for a full day, as they headed north to Lake Mill Lacs and other points. Highway 101 touches the Eastern side of Lake Minnetonka, and today crosses over a bridge at Grays Bay. The road is expanding for heavier traffic. A mile further south, Minnetonka Boulevard crosses Highway 101. This 2-lane ”boulevard” roughly follows Minnehaha Creek, whose source is Lake Minnetonka. Minnehaha Creek empties into the Mississippi River at legendary Minnehaha Falls. The mighty Mississippi river empties into the Gulf of Mexico, and then to the oceans of the world. Minnetonka boulevard is a small restless road that changes directions sharply and always moves west, like the early settlers. Henry W. Longfellow wrote 'The Song of Hiawatha', a heroic poem of the triumph of “The Noble Savage” (a popular 19th century theme). The poem mentions the lake, the stream and the waterfall. It was published in 1861. 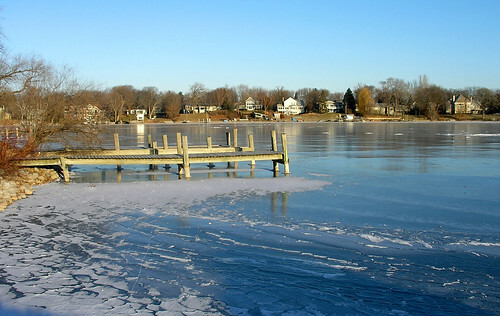 The poem brought about a frenzy of interest in Lake Minnetonka and hastened the Lake’s “Guilded Age". A time of European-style opulence and class distinction. The two roads cross in the city of Minnetonka. It is an unseemly intersection of 2 cultures, with a dangling 3 color semifore. This intersection is under construction until fall of 2007. 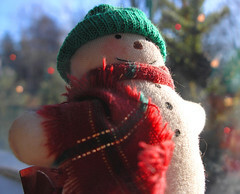 OK, I am going to let him out one more time, to fly about delivering gift packages and moooching free food. I hope Minnetonkascenes readers have a wonderfu holiday. 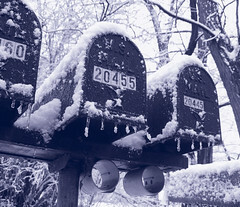 By the way, the snow finally arrived in a dreadful, 32 degree slush and snow combination. Bring It On! Snow that is. My lights are up. 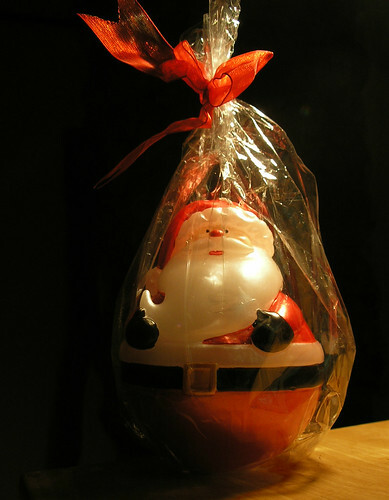 I have purchased my quatities of coal for the stockings. We have sucessfully kept Rudolf out of the Reindeer games again this year. He loses the nose and he is back in. But we have no snow! I walked out the door to let the dogs out and was greeted with pelts of frozen rain. No snow. I get more Google searches about “Biellas” in Excelsior (and its sister restaurant Ravellos in Long Lake) than any other topics. I have eaten at both restaurants and have nothing but praise for the food, attentive service and the sincere Italian dining ambience. Hey,- I lived in New Jersey for 2 years, where I was exposed to ambience. Clams Cassino anyone? ....I once walked into an Italian restaurant in new Brunswick as the fiery owner threw a steaming calzone at the refrigerator while shouting angrily "we don’t deliver small pizzas!” into the phone receiver (black, wall mounted style telephone). They made best calzones I have ever had. 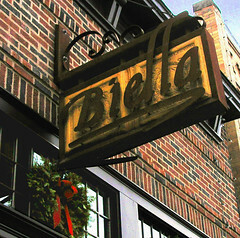 Back to Biella; The owner of both Biella and Ravello restaurants, Mark Nazigian, is the type of guy who is not averse to standing in the July heat, over a smoking Italian Grill on Excelsior’s main street serving customers hot Italian sausage and peppers panninis. His jovial smile is broad and unnaffected. Truffle Gnocci with oven roasted tomatoes, asparagus and baby artichokes. The colors are so subtle. The lake is alone. 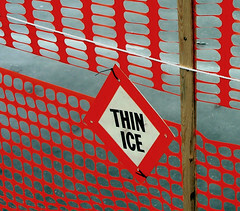 A coating of water covers dark ice. Warm weather has scattered the ice fishermen, skiers and skaters. 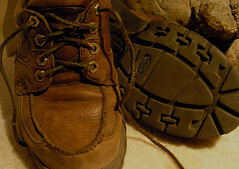 Just a few songs about walking, selected lyrics and my commentary. Take a walk! Comment: This was the beginning of “power walking”. Comment: Great song, only #12 in the charts, perhaps a bit preachy. Comment: Ya, and you can take your crummy Blackberry too - no, wait! Comment; And he run with scissors too. Want the words? - see the movie. Really. Comment: And if you can, run. Comment:Further instructions included hiding behind a potted plant. Comment: This early 60s folk song was part of the ‘happenings’ scene. A “new way of walking” involved sitting. Mars? A short drive down to Carsons Bay and I have discovered frozen water. 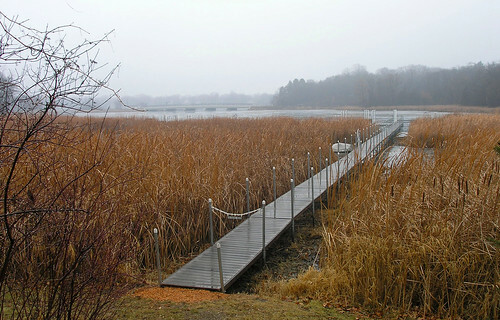 "In 1855, Wayzata had an influx of settlers who built a sawmill, a hotel and a blacksmith shop. Most early settlers made their living off the land, first by clear cutting the trees to grow corn and wheat. In 1857, this flourishing economy was nearly terminated by a grasshopper plague. But then ginseng was discovered in the remaining hard wood forest which had been left standing, these trees being too great a distance from the lake to float down stream to the sawmill." Locust Hills Development Corporation is in the process of building 44-47 Villa Homes just South of the intersection of 101 and McGinty Road- I have written about this intersections before. Locust Hills... an historically infamous and unappealing name. How did this developement obtain it's name? This new developement is built near Grays Bay, but not quite on it,- it has its own "lagoon". It is billled as a 'new urbanist' (my name) type developement. 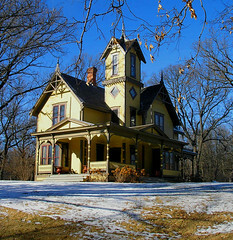 The Locust Hills. 1. Rocky IntraVenus - Sylvester Stalone plays a washed up world boxing champion who must fight an apparently invincible "alien child” whose father was born near Area 51, New Mexico in 1947. Balboa is the only man on earth who can withstand the giant's kryptonite laced blows (the Rock's head is lined with lead). Rocky finds he cannot knock out the alien hybrid, but eventually a sunami of sweat splashing from Rocky’s face have a deadly impact on the “green giant”. The World Heavyweight Championship of Boxing is returned to earth! Rocky uses the Medicaid Program to pay for his recovery. 5 out of 5 stars. 2. Casino Royale Pain- the 6th James Bond (Daniel Craig) has lost all bond to his original 007 identity (even worse than Bewitched’s bland Darin II) Bitter, he doesn’t care if his Martinis come shaken or stirred, just as long as they keep coming. Massive explosions, expensive cars and a cool British accent carry this film. 4 out of 5 stars. 3 Deja Vu- You! An old Crosby, Stills, Nash, Young, Taylor and Reives song sets the musical tone for a film in which the treadworn “been there, done that” phenomena is fully explored. Denzel Washington plays a government agent caught up (in a role) and a mystery that seems strangely familiar. Surpize cameo from The 5th Dimension! 4 out of 5 stars. - Some time travel,and mild profanity.